Hi, my name is Vickie and I like to write books. That sounds like an introduction at a Writers Anonymous Help meeting (WAH for short) and I kind of feel a bit like that in realising that I’m not meant to be writing about a book, but about me! Me! Me? Mmm. Now I feel like I’m at a new school, standing up, imagining I’m in one of those strange dreams where I’m naked with nothing to hide behind. I guess I normally hide behind my books or there are questions to answer, but thinking on my feet about me... mmm... help! So what is there to say about me? My favourite colour is blue; I drink too much tea (trying to cut down); I rather like white chocolate (esp Milky Bar), baileys and ale; I love travelling and waking up to something new every day, liking change; I love the smell of the rain (it smells green), baking bread, freshly cut lemons and vanilla; I really enjoyed The Waking Dead, Buffy, Red Dwarf and Downton Abbey (opposites! ); my fave books include Pride & Prejudice, Fantastic Mr Fox, The Tales of Hans Christian Anderson, Keat’s poetry and The Magic Toyshop; I love the sea; the music I like meanders between rock, blues and hippy stuff with the odd squeal of metal; I love rainbows, nature, daffodils, birdsong... and animals. Animals are my big love. The longest relationship I’ve ever had with an animal is with my cat, Mogsy, who is now 13. I guess she couldn’t escape my quirks and oddball-ness! I grew up with furry creatures everywhere. We always had pets in our house when I was young, to the point that I think we could have charged an entry fee as a petting zoo. You name it, we had it, and I talked about all of my pets recently in a blog piece for World Animal Day. My furry friends have inspired my writing. My first dog was called Glen, but I was really young and I don’t remember much about him, except that he covered me with dirty water whenever he went for a swim, but I immortalised him in a book called 3 Heads & A Tail, which I wrote for NaNoWriMo. I think every writer should try this at least once – it’s very freeing. My attempt was a seat-of-the-pants job and I wasn’t sure if the story would make sense to anyone, never mind make them laugh, for it’s a comedy romance and the hero is a dog called Glen. Okay, Glen turned from a Border Collie into a Labrador because I love those yellow dogs so much. Guide dogs for the blind are just amazing. 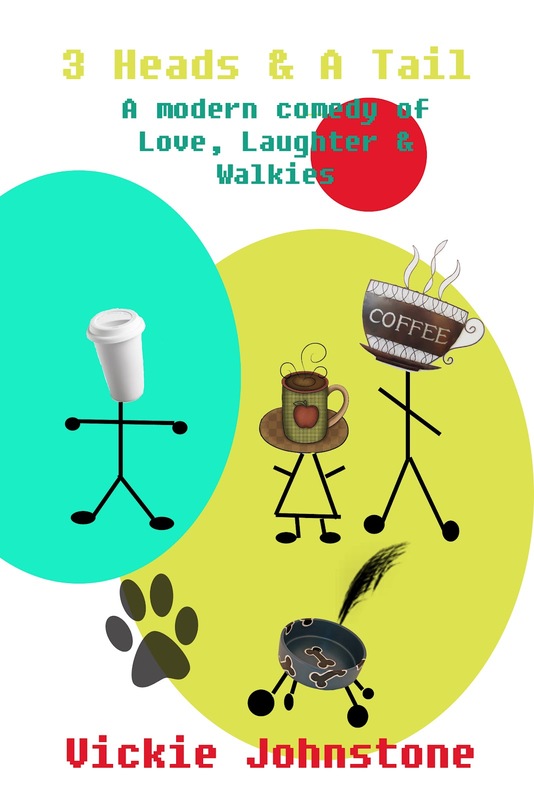 In the book, the dog is the central character, around whom everyone else revolves. He’s emotional, intelligent, a bit eccentric and in love – with the cutest dog in the park, Mimi. I am also writing a series for young readers starring a cat. She’s magical and surprised her two young owners, Amy and James, by talking one day. The cat got bored of never communicating, you see, and just decided to go for it. Shock over, they all go on adventures to animal-inhabited worlds, where the creatures live as humans. I think this goes back to my love of any animal story when I was a child. I wolfed them down. From The Ugly Duckling to the Three Little Pigs, Fantastic Mr Fox, The Incredible Journey and Watership Down to Pigling Bland and Animal Farm, human characters just didn’t get a look in. To me, they weren’t as interesting as animals, especially ones that could speak. When I was a little girl I thought I could communicate to birds by winking! Honest! And nope, they never answered back, or at least, I could never decipher their chirps. day she followed me to the supermarket, waited patiently outside on a wall, and then came back home with me. 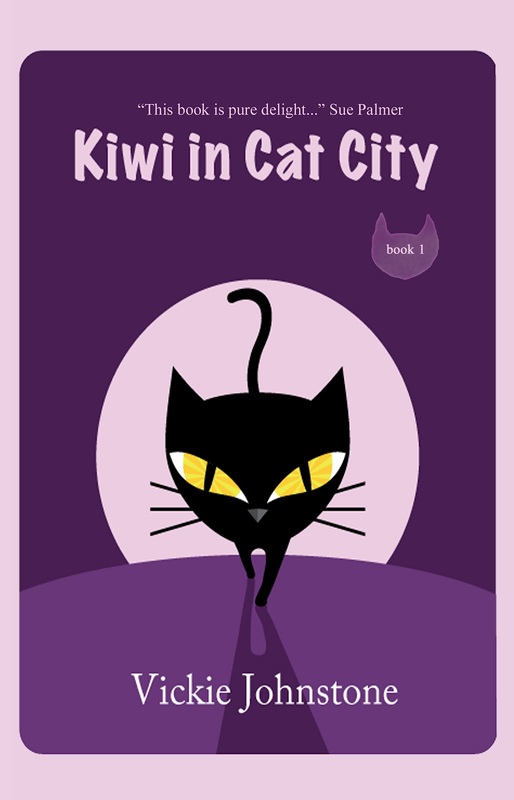 Now she’s the heroine of Kiwi in Cat City, and never a finer heroine could there be. Kaleidoscope (March) – a gathering of 119 poems, divided by chapter themes; Travelling Light – a small, free book of poetry; Kiwi in Cat City – the first in a series about a magical cat and her human pals (April); Kiwi and the Missing Magic (June); Kiwi and the Living Nightmare (October). I'm thinking of trying nano this year. I just need an idea for a shorter novel than my last one! I'm so glad you discovered Vickie Johnstone and got this interview. I've read two of her books and have since discovered she's a wonderful poet. 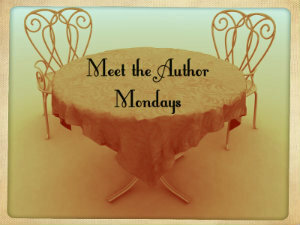 You're interview gave all of us some more insights about this creative author. I'll be purchasing all of the Kiwi series very soon and can't wait to read them knowing I'll find out from an expert just how it is done. Good on you Vickie for a great interview! What a fun piece, Vickie! I too am inspired by my furry and feathered friends....I haven't told them that they've ended up in my novels because I don't want it to go to their heads.